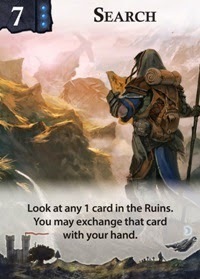 Designed by Seiji Kanai, designer of the great Cheaty Mages and the sublime Love Letter, both of which have already been converted to western versions by AEG in the part, Lost Legacy has players searching for ancient artefacts via player elimination and deduction. Set in a fantasy science fiction and fantasy setting players are searching for pieces of an ancient alien space ship. If you’re familiar with Love letter then you’ll recognise the basic gameplay of Lost Legacy. 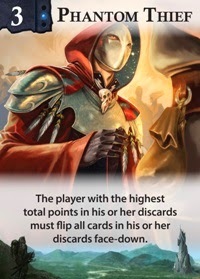 Play involves picking up a card and then discarding one of the two in your hand, the discarded card giving the player an action that can be used to swap cards or eliminate other players. The aim is to either eliminate the other players or have the best investigation score at the end of the round, players then have to identify where the Lost Legacy artefact is. AEG will be releasing three different versions of the game. 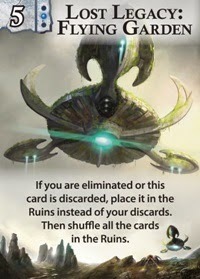 Each set uses the same rules but will contain a different set of cards; each set can be played completely independently or can be combined to create a unique deck for every game. 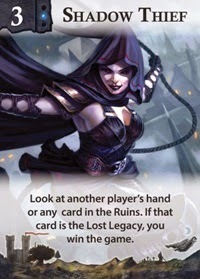 All three Lost Legacy set will be released in the summer 2014.